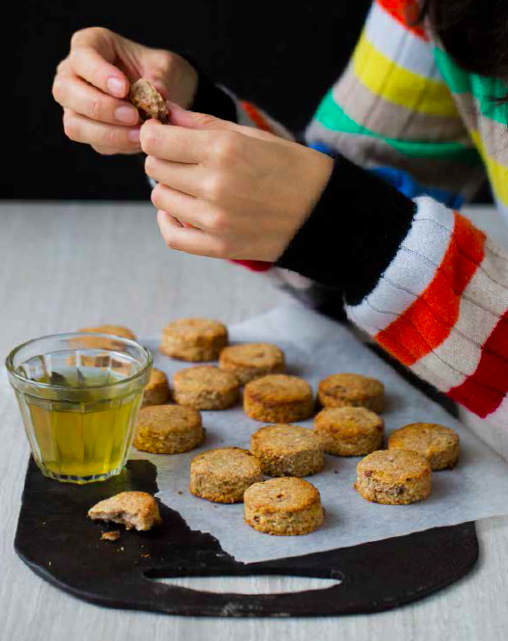 I had a blast filming the making of these delicious date and cookie dough bites (pg 106-7 in East by West) with @thehappypear in their kitchen in County Wicklow, Ireland. I laugh so much my face hurt!! Watch the video for the shenanigans and try the recipe yourself at home for a perfect snack for little and big kids like us!! Combining milk and banana is an Ayurveda digestive ‘no-no’, so banana milkshakes are out — but, thank goodness, banana cookies are still in. These little cookies, with their nostalgic banana flavour, remind me of being a kid. Mixing banana with dates and desiccated coconut makes an easy dough, which is then baked into cookie shapes — filling the kitchen with a delicious aroma. Watch the children and adults alike descend on you! One of these cookie bites is the perfect way to begin your lunch. Preheat the oven to 180.C (fan 160.C/gas mark 4). Place everything in a food processor except the dates. Pulse until well blended. Then add the dates and pulse again until evenly distributed. Divide the mixture into eighteen balls. Place them on a lined baking sheet and flatten so they are around 1cm thick and 4cm wide. Bake for 15 minutes, then turn them over and bake for another 10 minutes or until golden brown all over. They will still feel a bit soft, but they get crunchier as they cool. Leave on a wire rack until completely cool and enjoy! East by West Tip: These delicious bites are a great way to introduce the magical world of spices to kids, and since the batter is good to eat even when raw you can add, taste and adjust. Try a sprinkle of cinnamon, dried ginger or even some crushed cardamom to help develop their taste buds - go easy at first and then build them up!